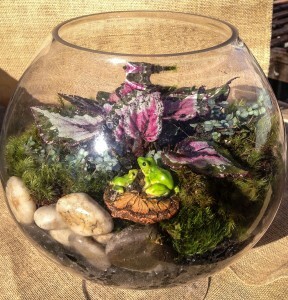 Miniature garden frogs are at home in a terrarium! Winter is the time to plant in the greenhouse, and plan for spring. After the holidays when it’s quiet is the time we plant and plan…terrariums can be time consuming, so this is the perfect time of year to design them. 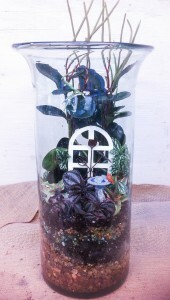 Terrariums can be made in any glass container, either with a lid or without. If it’s not enclosed you may need to add water a bit more often, but be very careful not to overwater. We use activated charcoal to alleviate any bacterial problems from water that may settle in the bottom of the container. Simply sprinkle a layer of the charcoal over the bottom layer of pebbles prior to planting. 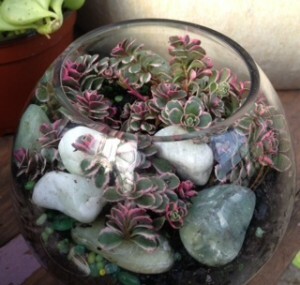 The layering of different colored pebbles, pea gravel and stones add a decorative element to any terrarium, and are quite fun to play with. Once this bottom layer is complete, add a light potting soil and plant your terrarium. The posts on ferns and miniature plants may help you choose which ones to use. The last step is to add any decorative moss, larger stones, miniature gardening accessories, or natural items gleaned from your yard. These might include small pinecones, pieces of lichen or whatever strikes your fancy! This entry was posted in Arrangements, Container, Ferns, House Plants, Indoor Plants, Miniature Garden, Planting Tips, Terrarium and tagged planting a terrarium, terrariums on February 11, 2014 by Kris Blevons.